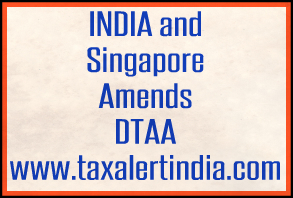 The Third Protocol amending India-Singapore Double Taxation Avoidance Agreement (DTAA) which was signed on 30th December, 2016 has entered into force on 27th February 2017. The same has been notified in the Official Gazette today. two-year transition period from 1st April, 2017 to 31st March, 2019 has been provided during which capital gains on shares will be taxed in source country at half of normal tax rate, subject to fulfillment of conditions in Limitation of Benefits clause. The Third Protocol also inserts Article 9(2) in the DTAA which would facilitate relieving of economic double taxation in transfer pricing cases. This is a taxpayer friendly measure and is in line with India’s commitments under Base Erosion and Profit Shifting (BEPS) Action Plan to meet the minimum standard of providing Mutual Agreement Procedure (MAP) access in transfer pricing cases. The Third Protocol also enables application of domestic law and measures concerning prevention of tax avoidance or tax evasion.